If you are one of the busiest person in town and you have to keep up with the busy schedule, Google Calendar APK 5.6.10-141990130 for android might be the best answer for you. This mobile application will not only help your to organize and manage your schedule, but this feature is very fun to utilize too. There are many feature in this application, such as multiple calendars, customizable notifications, and meeting invitations. The good news is, this app has been innovated with some other brilliant features, like feature which can create events from the email automatically. This smart app can also be used with Yahoo, iCloud, and Microsoft Exchange account. What an app! This mobile application is also coming with a new design. It has a relatively cleaner design with colorful graphics that will add the style of the application itself. Even though the look is different from the calendar on the Web, the way how to use it is still very much the same. Some features, such as Day, 3 Day, Week, and Schedule are still the same. However, the Month section which was available in the earlier version, is erased and replaced by Schedule view. The Day and Week section consist of hour-by-hour section to give you more space to deal with your specific schedule on that day. Plus, there is a zoom-in and an zoom-out feature to give you a clearer reading. 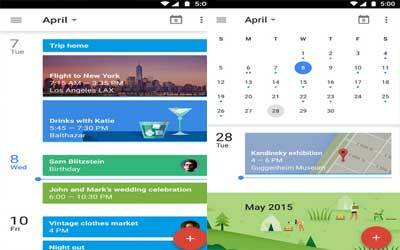 Google Calendar for android is also relatively easier to be used to create new events. With the help of Assists, this application will give you the most suitable suggestion of the event you want once you start to type it. This application is very good for your who happen to have a regular schedule as this application will remember the phrases you have ever used in the past. A new Schedule View – See your schedule at a glance with photos and maps of the places you’re going. Events from Gmail – Flight, hotel, concert, restaurant reservations and more are added to your calendar automatically. Assists to fill in your calendar – You can quickly create events with smart suggestions for event titles, places and people. Different ways to view your calendar – Speedily switch between viewing a single day to getting an overview of multiple days at once. All your calendars in one, easy place – Google Calendar works with all calendars on your phone, including Exchange. Month-view widget – See your month at a glance by adding the widget to your home screen. (Android Nougat only) Alternate calendars – Add a non-Gregorian calendar–like Lunar, Islamic, or Hindu. (G Suite only) Find a time & book a room – Add colleagues as guests to your event and Google Calendar will find the best meeting times & rooms for you. Much better than the previous version. Month view is back and great.